I started making these pint ice cream cozies after my daughter's friend requested them. I don't like overlapping seams or hook and loop closures so I used elastic to secure it together. 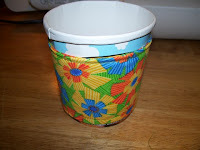 fabric (minimum of 10" X12")--this can be all one fabric or two pieces about 5"x12"
To make the pattern, you will be disassembling the container. Start by cutting off the rounded top edge. Then poke a hole in the bottom and tear out the disc on the bottom. 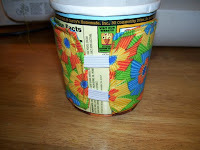 Finally, cut along the seam down the length of the container. Lay this flat and it will serve as a pattern for the fabric and batting. Transfer the pattern from the cardboard onto the fabric. 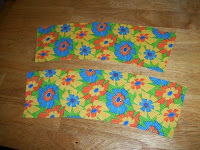 You will need two pieces of fabric cut from this pattern. These can be the same fabric or two contrasting or coordinating fabrics. Center the insulating layer on the wrong side of one piece of fabric. Temporarily secure in place by basting or pinning. 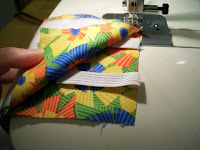 When pinning, be sure the pins are inserted from the RIGHT side of the fabric or you'll eventually trap them inside. Next, layer the two pieces of fabric, right sides together with the insulating layer on top and pin in place. 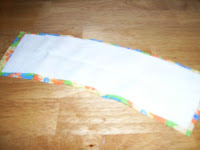 On one of the short sides, pin the piece of elastic between the fabric layers about 1" from each corner. 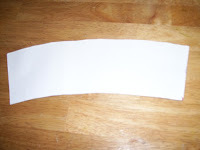 The edge of the elastic should line up with the edge of the fabric and the length should be sandwiched BETWEEN the layers of fabric. Start sewing on the non-elastic short side about 1" from the end. Backstitch to secure. Continue sewing around the whole thing, finishing 3/4" from the other ends of the beginning side and backstitch to secure. Refer to the black line in the picture to see where the stitching goes. Clip the corners close to the stiching. 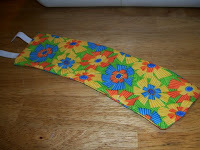 You can clip toward the sewing on the curves if you'd like but the curves are so gentle it hardly makes a difference. Turn the fabric right side out. Push out the corners, fold the open seam in, and press for crisp edges. 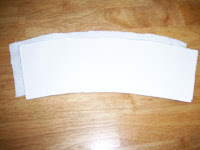 Tuck the elastic into the open seam near the edges of the opening. Leave 1/4" to 1/2" of elastic showing and pin the elastic in place. Stitch 1/4" from the edge of the fabric, catching the elastic in the seam. 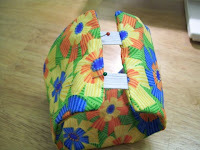 Continue sewing around the edges until you reach the original sewing to complete the cozy. Cool post as for me. I'd like to read a bit more concerning that topic. Thanx for giving that data.